Today we woke up and hit the trail knowing family and friends awaited. The hiking went super fast. We went through a 6 mile stretch that was labeled in our AT guide as “very rocky”. It really wasn’t bad by Pennsylvania standards, except for a few loose rock piles as we descended down towards Duncannon. 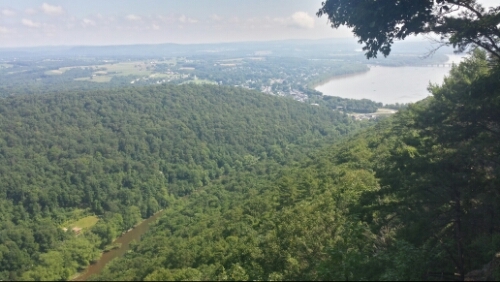 We had a nice view of Duncannon and part of the Susquehanna river from Hawk Rock. A good 3 miles or so of trail went right through Duncannon, which wasn’t overly scenic or exciting. Then we crossed the Juniata and Susquehanna Rivers and met Ma and Pa Trippy in the parking lot (and Pat the littlest pooch). It’s very exciting to see them and to be able spend this weekend with family and friends. We’ll be back on the trail on Monday morning, but it’s rest, relaxation, partying, family, and friends until then. Adios! This entry was posted in updates on June 27, 2014 by Joel.